The letter enclosed, written by Chang and a few other students who had graduated in 1985, was a call for divestment from companies doing business in South Africa under Apartheid. “Many of us wear armbands today to remind both College officials and our friends, family, teachers, and fellow students about the deteriorating situation in South Africa and what role the College might play in improving the situation … during the past four years at Swarthmore we have become more and more familiar — through films, course work, symposiums, and even late-night discussions — with the apartheid system of South Africa,” Chang and others wrote. They then urged President Fraser to take two specific actions. First, to contact the College’s Ad Hoc Committee on Ethics and Investments, created a the year prior, and urge them to support a new provision. This provision reconsidered the College’s policy since 1978, which established that the College would maintain investments in South Africa as long as they followed the “Sullivan Principles,” which the Swarthmore Anti-Apartheid committee considered to be a cover for companies wanting to stay in South Africa. The second thing the students urged was for Fraser to publicly support the proposed Anti-Apartheid Act of 1985 being considered by Congress. Chang and others ended with a concrete consequence for the college if it did not divest. 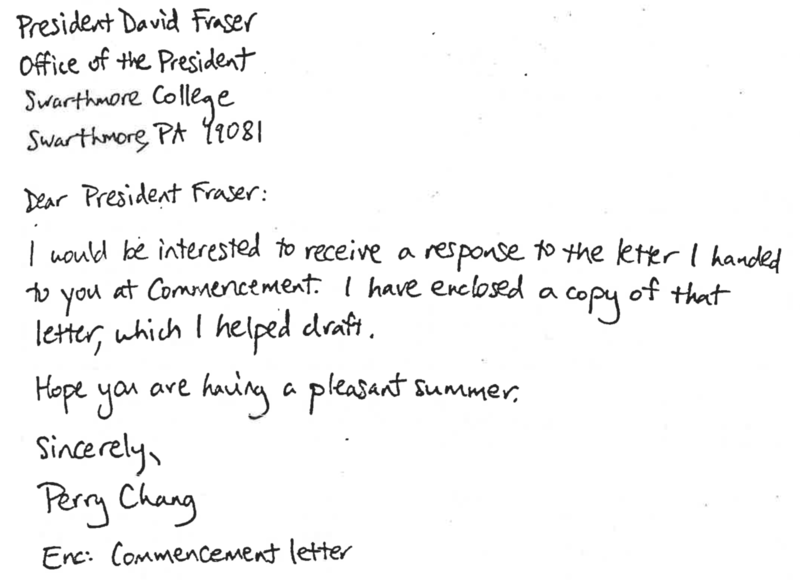 On June 28, 1985, President Fraser sent a letter back to Chang. In his letter, he outlined his dismay for the situation. Fraser also outlined recent discussions in Washington on Apartheid. Despite this, Fraser explained that he was not personally yet convinced that the College would do better to follow total divestment, and that he looked to the committee of guidance. He did accept the second demand, and publicly expressed support for the passage of the Anti-Apartheid Act of 1985, however warning that this did not commit the college itself to a particular stand. In 1986, the Anti-Apartheid Act passed in congress and the College board of managers reached a decision to proceed toward full divestment. Full divestment was reached in 1990. Apartheid legislation in South Africa was outlawed in 1991. 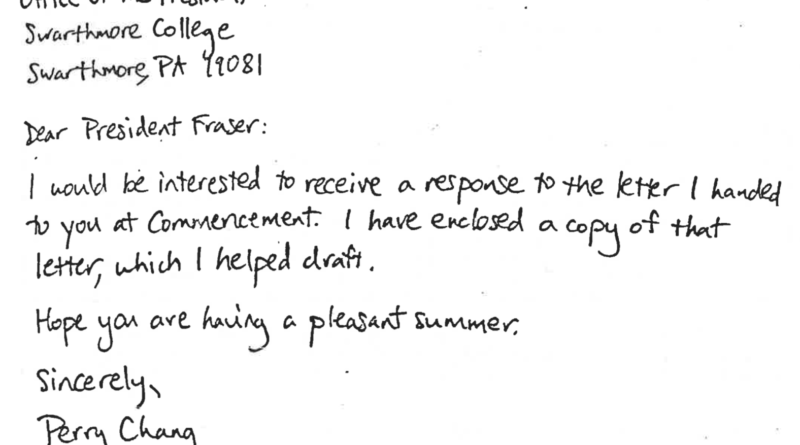 The process, though, was a long and halting one; Chang and President Fraser’s exchange is a mere slice. Next issue, I’ll outline the actual process of the College’s progress toward apartheid divestment. In many ways, this process can be seen as analogous to the current movement for divestment from fossil fuels: in April of 1985, before the Committee came to a decision, the College held a referendum in which 79% of the students who voted called for total divestment to replace the Sullivan principles. Mountain Justice held a similar referendum last year. Then and now, divestment is no easy process — hoops must be jumped through; drawbacks must be considered. Even so, morality in investment has been a question the College has been struggling with for decades and will, I predict, for years to come.